From General servicing & a few specialist repairs in 1954 to One of the Worlds Leading Independent Aston Martin Specialist's. Jack was born in Nether Whitacre on the 1st July 1916, his father was killed at the Battle of the Somme & never saw his son. Jack enrolled as a Wolseley apprentice which was a 'sought after' apprenticeship similar to Rolls Royce, in the early to mid 1930s he was told to go to the Earls Court motor show to observe & make notes on the opposition to Wolseley, however he spent several hours gazing at the Aston Martin 1.1/2 ltr International, he did eventually buy one over 20 years later. 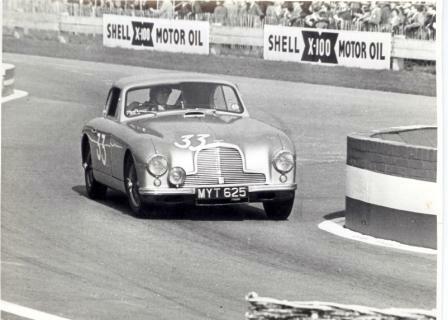 In his days at the Wolseley Jack met other apprentices who later became involved with Aston Martin, one of these was Hubert Patthey who drove the Prototype DB4 GT at Le Mans 1959 & became the Swiss Importer & Agent for Aston Martin's (alongside other British high class marques) up until John Wyer left for Ford in 1963. During the war Jack worked nights at the Wolseley in Birmingham (where he was apprenticed) to supplement his income from his 1st workshop in Nether Whitacre. He then ran Furnace End Garage near Nether Whitacre unitl 1954. 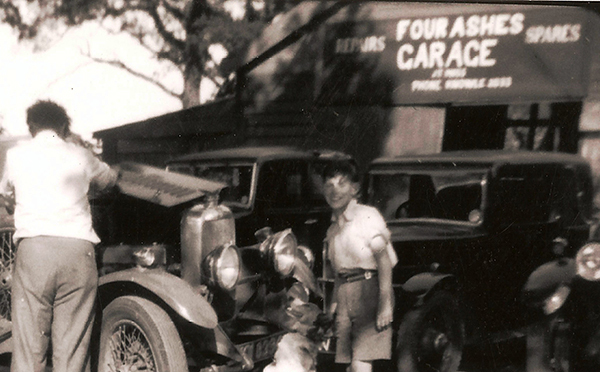 The above is a photo, circa 1955, of the garage at Dorridge - Jack with his back to the camera, a very young son Michael (aged 12 or so) & Rusty. Dennis Cooper & Jack soon had a parting of the ways. 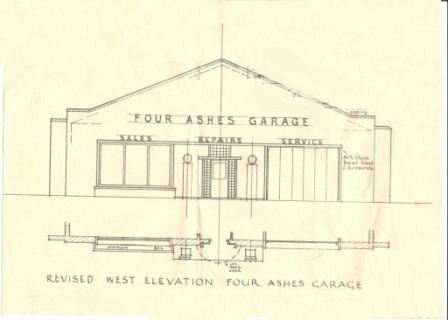 Four Ashes Garage became Four Ashes Garage Ltd on 28/03/1957. Tom acquired the JAP engined Carlmark Shelsley Walsh special in the mid fifties, it was hillclimbed 5 or 6 times, Tom swapped a car for a van to transport it, only problem was the box was too short ! Prescott was a local hillclimb, here are some photo's from there. Tom put 2 boards 'hanging out the back' of the van as the box was too short. Tom didn't realise the Carlmark was in fact the only one made Prewar, it was built by H.D Carlmark and had a Fiat 500 (Topolino ?) front end grafted on to a GN chassis and a solid rear axle - it understeered a lot ! The garage was rebuilt as a typical modern 60's style brickbuilt garage by Clemm Hassall & his son, John, builder's from Fillongly. The line drawing above was the Architects Drawing that was accepted by Solihull Council in 1957. The frontage was built exactly as the drawing with the 2 fuel pumps either side of the main entrance at 1st, these were moved to an island in the middle of the forecourt which allowed more pumps / cars. About 50ft wide, this encompassed the showroom on the left (below the Four of Four Ashes) which was accessed from just around the corner of the left side of the building, the central entrance / reception area had the petrol attendants office just inside this central entrance, the office was situated above the reception area and the one service bay entrance was on the right, accessed by green sliding doors. The rear of the garage workshop was a steel structure with corrugated asbestos sheeting, as were most industrial building's at that time. An extension was later added to the building, this is the darker shade of roof on the photo below. Tom's large US built WW2 'Ward LaFrance tank wrecker' breakdown truck was parked on the left between the hedge & the side of the garage. Photo circa 1970, this is as it largely remained until Jack sold the garage to Mike Grimes (Nissan) in 1976. Four Ashes got busier with more specialist cars coming in for repair, including local man Sir Donald Bird of Birds Custard crazy collection of motor cars, including a Supercharged 1959 or 1960 Mini, one of 1st E Type Jaguar's, a Rolls Royce Phantom 111 (V12) + other cars & many other madcap owners, Jack leading the team on the more specialist car repairs / problems, whilst other members of Jack's team looked after the increasing local populace, which included the local 'unmarried' mothers home, a Convent of Nuns, a local MP, local doctors. 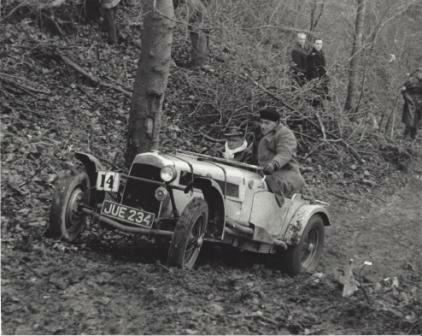 In the mid 1950's Jack met Alex Francis & they converted some cars to Trials Specials, one (the 1st?) of which was the Francis / Moss Special, this originally had a Singer engine, it may have originally been a Pre-War car as the original engine was sold to someone in Scotland in 1949. We have some correspondence with an (the) owner of the Francis / Moss Special. Alex Francis was a local builder, he was later to become Alexis Cars in 1959, a very significant F3 & other single seater manufacturer, this was in partnership with an Australian called Bill Harris. It turns out that some of the above information is incorrect, Alex Francis found Jack could put the car together how he wanted it & so the parts where duly despatched to Furnace End Garage from another workshop who had started the work, local nr Furnace End Garage, the cost estimated at £30 but came in at £156, a lot of money for 1949 ! The 1st Alex Francis Trials Special was in fact the HRG works demonstrator registered GPE 607 which originally had a Meadows 1.5ltr then a Singer engine & the car was raced pre-war by such people as Prince Bira at Brooklands, Lord Deramore in the Paris-Nice trial & by Guy Robbins, a partner in HRG, at numerous motorsport events. 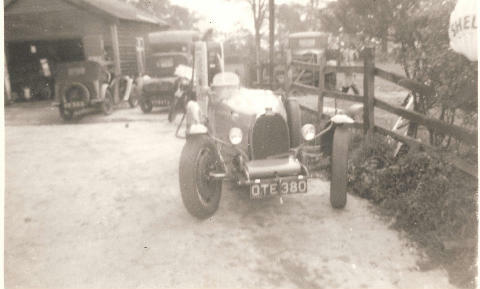 Alex Francis bought the car from Sir Clive Edwards just after the war. He got hold of some ex - MOD new Mercury V8 engines from Fletcher's in Gosta Green, Birmingham then he & Jack fitted one to the HRG in about 1949, it was re-registered JUE 234 & the Chassis Number was changed to reflect its new identity. Here is is on the 1950 Fedden Trial. The car still exists ! Alex Francis's finest hour in the car was at Prescott in September 1954, Masten Gregory brought a 4.5ltr Ferrari over after competing at the Tourist Trophy race & did an astounding 46 seconds in the dry with it, however he hadn't reckoned on the English weather & Alex Francis, in his 16 year old Francis Moss special, beat Gregory with a 52.77 second run, 0.34 seconds faster than the Ferrari. In the mid to late 1950's, according to Tom Butler in a recent interview, John Churchley of Monkspath Garage bought out Swallow Doretti, a TR2 based special built in Aldridge, Staffordshire. Churchley sold many other specials & kit cars as well as spares for Doretti's. Tom, who was in charge of the body & paint shop at Four Ashes, painted 5 or 6 fibreglass bodies for Churchley, he thought they were Swallows (but may have been Kenmar's) but wouldnt swear to it. On with Four Ashes History. In 1959, Michael, Jack's son joined the business with Jack, Tom & several other employees, having previously worked evenings & weekends. Four Ashes Garage became Austin - BMC distributors in the late 1950s, this meant they had could sell all of BMC's & then Rover / BMC cars. In October 1963 The Applejacks was formed, they were a local band who had links with Four Ashes - Phil Cash, the rythym guitarist worked by day as a mechanic at Four Ashes, he became Phil's Mowers of Knowle, the roadie was Michael Collins, the Four Ashes forecourt attendant, he runs a plant nursery near Shrewley now. Four Ashes became Rootes dealers from about 1964, selling Imp's, Minx's, Hunter's, Alpine's, Tiger's then Rapier's, we still see some of the cars we sold locally. Eventually this led to 2 customers in Tiger's, one a pristine car with all the badges, etc & the other a scruffy one, meeting on the forecourt for the 1st time, scruffy car owner says the immortal phrase 'my word, isn't that pretty' - we still use 'the phrase', always nearly falling off our chairs ! More local customers included Braggs, the undertakers of Shirley, Ralph Adams (Chris's dad's) lorries, Bruno Colodi of Da Corrado restaurant (he had a DB MkIII saloon) & many others. The RRA Special (the Single Seat Aston Martin DB3S that raced in New Zealand ) fiited with a Jaguar engine & DB3S like body was looked after by Four Ashes Garage, when the owner bought it from Geoff Richardson of RRA, this was a challenge to keep it reliable as it produced far more power than the Works Jaguar engines from its over square 3.2ltr engine, It was sold after the clutch failed again when racing in the British GP Historic support race in 1970 or 71. Sometime in the early 60s they had a problem with a Mercedes Gullwing, it was sorted, both Jack & Tom roadtested it, the report on how good the car was wasn't good, with the biggest complaint being lack of brakes from very high speeds ! The garage picked up breakdown & wrecking contracts with Solihull police, a Land Rover was used at first then a small breakdown truck was made of a damaged Austin sanitary wear van, Tom had the only large, very large breakdown truck (a US Ward LaFrance tank wrecker, equipped with a UK bus engine & 14 speeds) for miles capable of shifting lorries & their loads, similar to the one below. Tom sold this truck in 1976, partly because the air brakes worked the wrong way round, if the air pressure got too high the brakes locked on, the Dept of Transport of the day wanted it changed to the more more normal european brake operation, partly because there was nowhere to store it at the new garage. The truck was sold to Bill Ewins, timber merchant from Liveridge Hill, Henley in Arden, for scrap, the truck still survives near Rugby and is used for shows, etc. In 1963 Michael Moss bought his 1st Aston, a white DB2 DHC, RBW 798 (this picture is after he owned it, he repainted Green) for £165 from a scrapyard with a cracked block, (this car had an original Service Dept Triple SU inlet manifold) after rebuilding the engine with a Lagonda block, both Michael & Jack realised that the DB2 series went rather well. 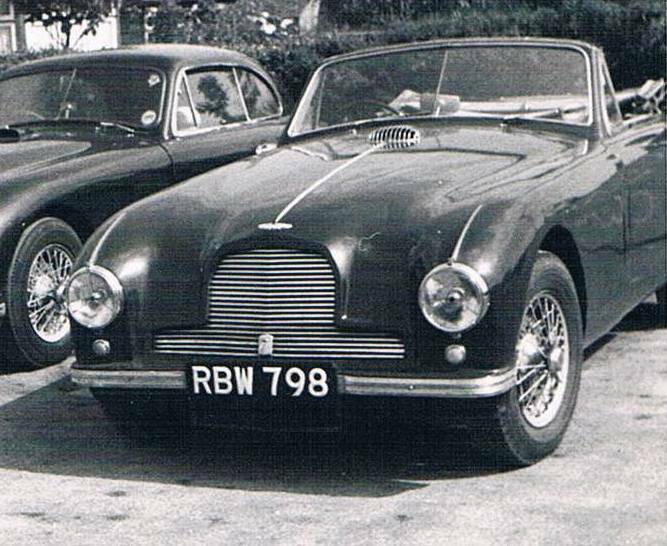 Michael used RBW regularly, his pride & joy, until someone in an Austin 7 ran into him & damaged the bonnet, one of the last ever Factory made DB2 bonnet's was bought from AML & fitted to RBW, Michael used it again then sold it to a Mr Herbert of Solihull. Michael & Jean, a local girl, were married in 1967, this was the first time the garage had ever closed for a whole day as the Garage even opened on Christmas Day. They rebuilt a Lotus Elan which was exchanged for a DB MkIII DHC and some money used as a deposit for a house. Jack bought himself a Red DB2/4 Mk I from the Factory as a cast off, this car came with many spares inc a pair of DB3S cams, it eventually turned out that the car had previously belonged to John Surtees, this car still comes to the garage after a full restoration carried out by Four Ashes in the late 1980s, then consequent sale in about 2003. MYT was bought for the bonnet & Mr Herbert was mobile again. MYT was then put out the back of the garage for a while, see Collecting MYT & its history. Aston's came into the garage more & more to be repaired, we sold some new DB6s & DB6 Mk2s in the late 1960s, early 1970s. One owner locally ordered his DB6 from Four Ashes, there was only one colour available from stock (it was when AML had stock and had to reduce the price by £1000 - 1967?) so he then selected a colour the same as his office door, it duly came & it was repainted his door colour by Four Ashes, the owner came in & said 'whose is that DB6, dont much like colour' 'yours' was the reply, it was painted 3 times in 2 months. MYT 625 is rebuilt & raced, see earlier link. Jack sold his MkI to Richard 'the Hair' (a barber) of Stratford upon Avon who then had a large accident in the Red DB2/4 MkI, the car was left 'out the back' as a write off. Tom bought the DB MkIII Prototype, 63 KMY, DB193, in the early 70s, Stephen Bamford, another Four Ashes employee bought it from him in 1974, Stephen went to work at 'Company Developments' Aston Martin Lagonda that year along with Ian R.Moss, Michael's younger brother (not the Portsmouth Ian Moss), they both worked at the Factory for about 18 months until Company Developments went into receivership. Increasingly Four Ashes worked on more & more Aston's, eventually other cars were being worked on less & less. Chris bought his 1st Aston in 1975, a DB 2/4 MkII FHC from Kerry Wilson, another Aston nut, for £475, Chris stripped it & rebuilt it over the next 6 years, not quite finishing it. Jack bought Pathlow Service Station (Orr-Tookey (Stratford) the owner was Texaco though), a garage 13 miles or so away from the old garage, near Stratford upon Avon. The Dorridge garage was cleared of hundreds of classic car parts, leaving only some classic car parts that Jack thought would be useful & many Aston parts of varying degrees which were put into storage locally to Pathlow. The old Four Ashes Garage site is now the 'Johnson's Alfa, Solihull' - it still occupies the same parcel of land that the original Four Ashes Garage did all those years ago, albeit built all around instead of open fields. Interestingly Pathlow Hill Service Station is opposite a building - pub called the Dun Cow, recently the Armouries Arms, now a private house called the Old Dun Cow, we believe that Chris's great grandfather owned the Dun Cow in the early 1920s. Pathlow is the site of the present Four Ashes Garage, 10 employees came from the old garage, 2 of them ex Aston Martin employee's, then the galeforce winds of January 1977 took the roof off !, luckily no damage to any cars. In those same gales Robin Hamilton had a DB6 that ended up with a badly damaged roof ! Michael bought Chris's MkII FHC from him, finished the final bits, used it & sold it to a German. Four Ashes rebuilt the engine & other mechanical parts of Ian Stowe's Pre War 1.5ltr Le Mans, in the hands of Chris Aylett this became quite a successful hillclimb car, taking many awards in the Pre War AMOC class. In March 1982, Chris Adams left Four Ashes for the 1st time & set up in partnership with another ex employee, Chris at 25, left thinking he knew everything, he realised 2 weeks later he knew nothing ! In November 1982 Michael, Jack's eldest son, Jean's husband was sadly killed in a car accident, this knocked the stuffing out of the garage & family, however they carried on. Jean started wprking at the garage full time in early 1983 although she had been making the carpets for customer cars for some years by then. Jean & Chris started seeing each other in 1983, they had known each other for years. 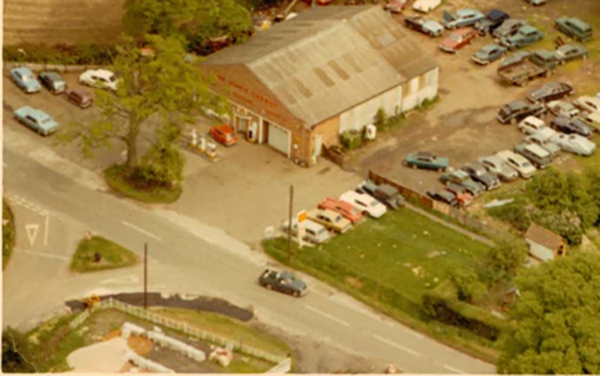 Chris fell out with Jack in the spring of 1984, walked out & set up Chris Adams Specialist Cars in Hockley Heath, a very successful company specialising in service & repair of perfomance cars, local race cars & local road cars, rebuilds of classic cars, etc. This is from the site of his fathers haulage business, Chris was given his fathers DBS, YPE 788 G, that he had virtually fully rebuilt for his dad. Four Ashes was very busy with Aston work right through the boom & bust of the 80s & 90s, Jack rebuilt his original DB2/4 for a local businessman. Bengt Morner met Jack when looking for parts for his engine, Bengt designed bits for major car manufacturers, fishing reels, chain saw brakes & lubrication systems (we think he designed those aswell) , etc. Bengt designed the much used large capacity oil pumps for Four Ashes & Rex Woodgates & found out the real cause of the poor lubrication, which resulted in Chris's research into oil pumps which has eventually proved the original oil pump when properly rebuilt has adequate capacity when these engines are assembled correctly. In 1985 Jack & Chris were talking to each other again, a conversation about the way forward in Feltham Aston engines revealed that we needed a new design of pistons for the 2.6 & 3ltr's, research was carried out & Steve Bamford looked into who could carry this out, Omega were chosen to manufacture these pistons which most of the Aston now world buy, often direct from Omega even though they are a Four Ashes Product. Chris was flat out until his mother & brothers sold the site of the family's haulage business & Chris was left without a workshop, he moved to Galway, Ireland preparing Opel Manta 400 rally cars by night & weekends, learnt to Tig weld properly at college then got a day job making large fabrications at a major steel fabrication company, then a truck repair company in 1999. Chris moved back to the UK & Four Ashes in December 1999. Jack's health had deteriorated towards the end of 2002, he ended up in hospital after a fall which he cracked his hip, this was at Christmas 2002, from where he never returned. In 2002 Chris & Jean bought a DB2 chassis & bodyshell, LML/50/163 that was advertised for scrap value by Brian Fearn - he didn't take scrap value money, this was for a rather special race car that Chris has been planning for some time. Chris & Jean bought Four Ashes from Jack's family on the 1st of January 2003, they immediatley made massive changes to the way the business works. Jack (John Trevor) Moss died in May 2003, a few weeks before his 87th birthday, his funeral was attended by a large amount of family, friends & Aston Martin owners, he was and is still greatly missed by many people. Four Ashes under the leadership of Chris & Jean continued to expand the business with less staff than before, restoring Aston Martin's, racing Aston Martin's, making more & more parts for Aston Martin's. In 2004 Andrew Sharp came into the garage and asked if Chris knew of a DB4 racecar that Andy could buy, Chris told him that he couldn't afford a DB4 (did I ???) & steered Andy towards a DB2, which Andy asked if he could have it rebuilt to race in the Spa Six Hour race of 2005, hopefully as a mid pack racecar, Chris & Andy did a deal for Jean & Chris's DB2 LML/50/163 which became 8 EMU, the all conquering Aston Martin DB2 that is possibly the 'fastest DB2 ever built'. 8 EMU has competed in many Historic Races including 2 x Spa Six Hour Races - thats right, full six hour races, the 2005 race was its 1st race - finished 28th. All of Le Mans Legends races featuring 1949 to 56 cars, several Le Mans Classic meetings inc 2006, 2008, 2010, AMOC meetings since 2005, Fiscar Meetings, Woodcote Trophy meetings, MG Car Club Meetings & many more - just 2 DNFs. Chris's engineering skills & Andy's considerable driving skills have kept the car at the top of the class, we originally fitted it with rather illegal front disc brakes for an FIA legal car, we changed to front drums at 2009 Le Mans Legends, Andy has since adapted his driving style & Chris further sorted the brakes, with other suspension improvements & an engine rebuild in 2011 netting a further 11% more power, it is still the DB2 to beat, then the head was rebuilt again in 2013 with some more minor changes netting a further 6.5% more power, hopefully this will keep the car at pointy end. They have also sorted out problems with DB4's, 5's, 6's, V8's & many other cars. We have lost a couple of our team besides Michael & Jack Moss, Derek Smith, our paint sprayer & prepper from the original garage, who moved with us & left the garage in 1990 or so, he died a couple of years ago & Bill Prangle, our friend & expert fabricator who worked for us from 1984 to 2007 (we also think he fabricated some of the Falklands Memorial to the soldiers who died there) to cancer just before Christmas 2012, sadly missed by us all at Four Ashes, RIP to all. At Four Ashes Garage Ltd we are proud of our 'independence' from interference with 'jumping the Corporate hoop'. January 2017, we have now trade marked Four Ashes, so it is now Four Ashes ® or Four Ashes Garage Ltd, & we have changed the Garage Premises Address back to near enough its original name, not Pathlow Service Station but Pathlow Hill Service Station which is part of our tidying up of some of the legal details that have been left unattended throughout the years. April 2017, Jean & Chris got married after 34 years of living together, still Mrs Jean Moss though !